The duck species was domesticated about 3,000 years ago by the practical Chinese. Domestic duck breeds have many uses. A duck not only feeds a family through eggs and meat, but provides feathers for stuffing as well. Anyone who has owned ducks also knows that they can be delightful pets as well as a home security system. Stranger are loudly announced. Ducklings have always been popular around Easter as a symbol of new life and new beginnings. But what becomes of those cute, fluffy creatures once all of the Easter candy is gone and the children’s basket contains only plastic green grass? One suggestion is to keep the duck and raise it as one of the family, or er, brood. Raising ducks can be as rewarding and economic as chickens. The eggs are especially rich and contain more protein and vitamins than chicken eggs as well as more calcium and iron. The egg shells are somewhat thicker and have a gloss on them. Young ducklings should be in a clean, dry shed or separated part of a barn. Each baby duck should have 5-6 feet of floor space when confined. Place an infrared light so that the temperature remains 85-90 degrees when the ducklingsarrive. Decrease the heat by ten degrees each week. 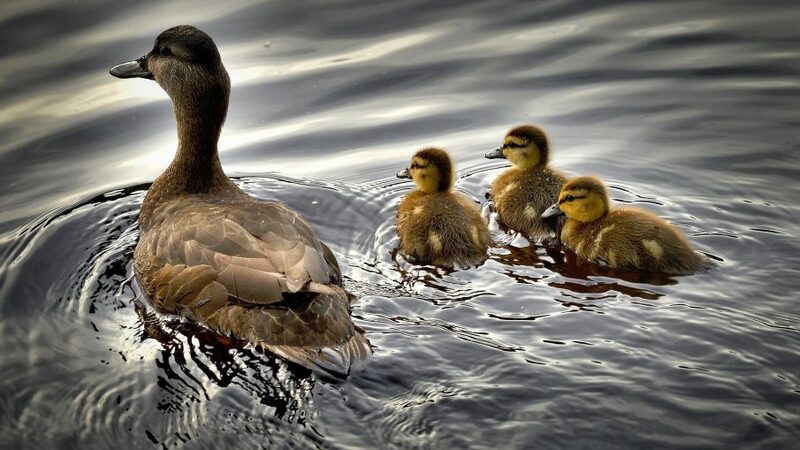 Ducklings of 4-5 weeks should be able to tolerate being outside (depending upon the climate.) Straw or hay bedding should be changed daily to avoid mold. Homemade waterers can be constructed with 2-liter bottles and shallow dishes or bowls so the depth of the bowl can contain the bottle upside down and have the neck covered. Ducks need water to rinse their bills and help break down the food. A shallow children’s pool (not inflatable) or large barrel cut vertically provides a swimming and grooming place. The feet of a duck is webbed as most people know, but they also do not contain nerve endings so getting in and out of the water may cause the legs and feet to be vulnerable. Chicken feed may be substituted the first few weeks, but you should feed your ducks duck feed as well as grain, cracked corn, or grower size grit. Eventually, ducks should be allowed to forage, but realistically, duck feed should be offered every day. Dangerous foods include bread, nuts, or chocolate. Ducks begin to lay around six months and lay about one egg a day, usually in the morning. Since ducks may live as long as 12 years, that means almost 4200 duck eggs! . Each duck has its own personality and can be as entertaining as any other pet. Most ducks are social and love to play and receive attention from their owners—just like most other pets. Some also like to play with toys or small floating devices in their pools.